E-flat Edition. Composed by Various. Hal Leonard Fake Books. Jazz. Fakebook (leadsheet notation). With vocal melody, lyrics and leadsheet notation. 448 pages. 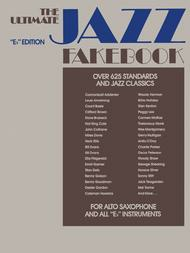 Published by Hal Leonard (HL.240081). 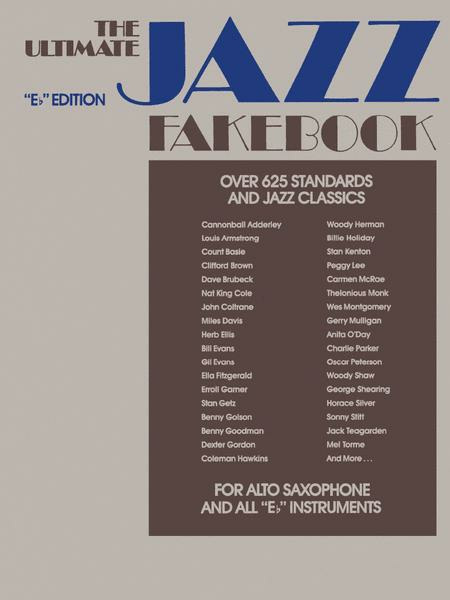 The Ultimate Jazz Fake Book includes: * More than 625 songs important to every jazz library * Carefully chosen chords with some common practice chord substitutions * Lyrics to accommodate vocalists * Easy-to-read music typography * Composer and performer indexes. The selection of songs in The Ultimate Jazz Fake Book is a result of an exhaustive effort to represent the many styles of music that make up that beloved idiom we call jazz. The styles found in this collection include: traditional, swing, bebop, Latin/bossa nova, hard bop/modern jazz and Tin Pan Alley standards/show tunes. More than 625 songs including: Ain't Misbehavin' * All the Things You Are * Au Privave * Autumn Leaves * Bag's Groove * Basin Street Blues * Bewitched * Birdland * Body and Soul * Cherokee * Cry Me a River * Darn That Dream * Desafinado * Django * Don't Get Around Much Anymore * A Foggy Day * The Girl from Ipanema * Here's That Rainy Day * I Can't Get Started * I Concentrate on You * Little Boat * Love for Sale * Love Walked In * Lullaby of Birdland * Milestones * Moonglow * More * My Foolish Heart * A Night in Tunisia * Ornithology * People * The Preacher * 'Round Midnight * Saint Thomas * Satin Doll * Sentimental Journey * Solar * Someday My Prince Will Come * Song for My Father * Strange Fruit * Take the A Train * Waltz for Debby * What a Diff'rence a Day Made * Work Song * Yardbird Suite * and many, many more! Spanning m ore than nine decades of music, The Ultimate Jazz Fake Book fills a void for many musicians whose active repertoires could not possibly include this vast collection of classic jazz compositions and durable songs. A wide variety of tunes most often associated with jazz. Should please most users if you like jazz music from the 20th century. Legible and the binding is such that the pages hold their place when turned, something that can be a nuisance in book style music.